A few months back, I went to this hotel called Choki Dhani close to Chennai for an evening & dinner. 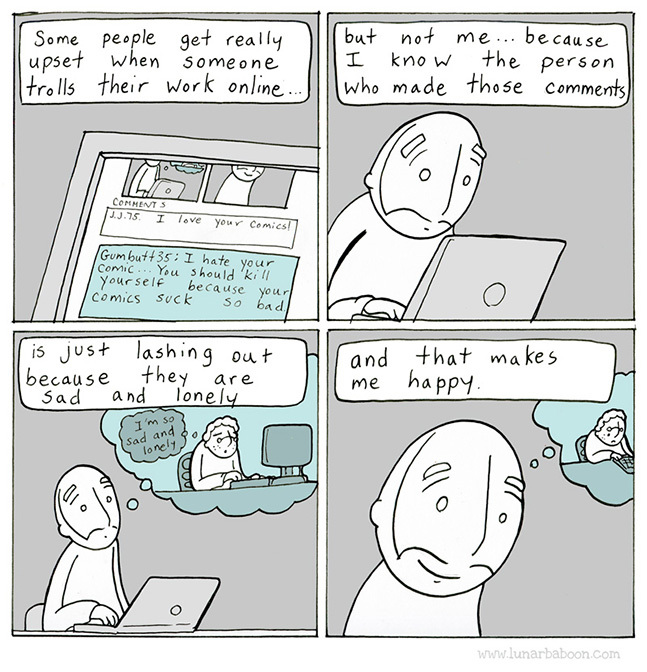 Originally I had no intention to write about it. However the place is too good for me to not write about it. 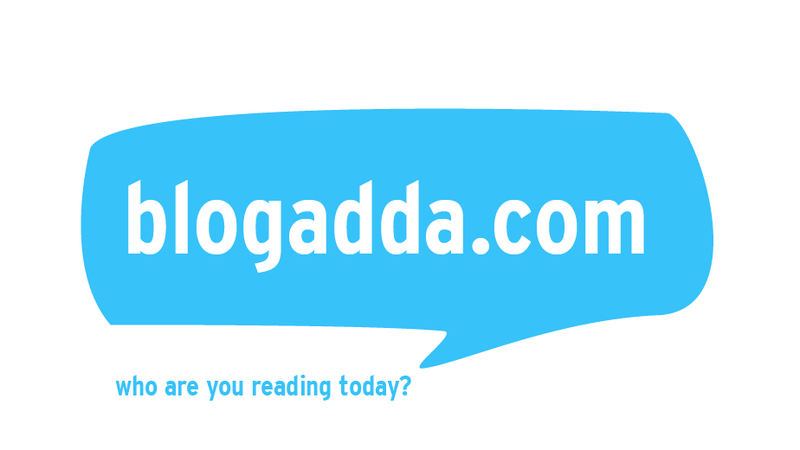 As the name says, its a Rajasthani themed restaurant and space! Space??? Well, its not just a restaurant. 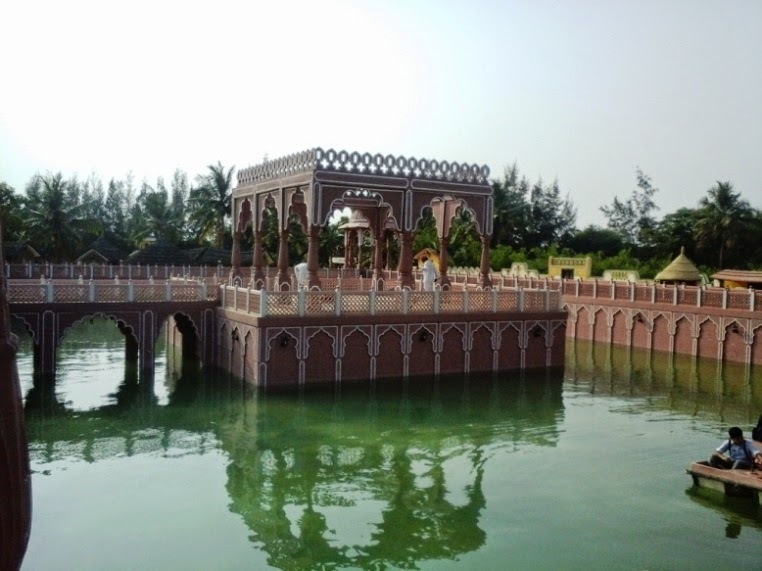 Its located in the outskirts of Chennai and in a huuuge space. Its a small village ambiance created in that space. Right from the entrance, everything is Rajasthani styled. 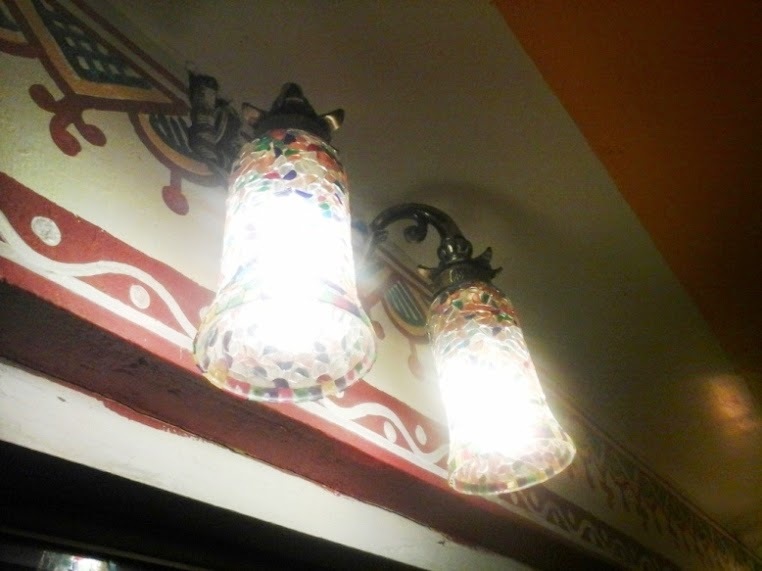 The walls are painted with wall art similar to Rajasthani tribal art. 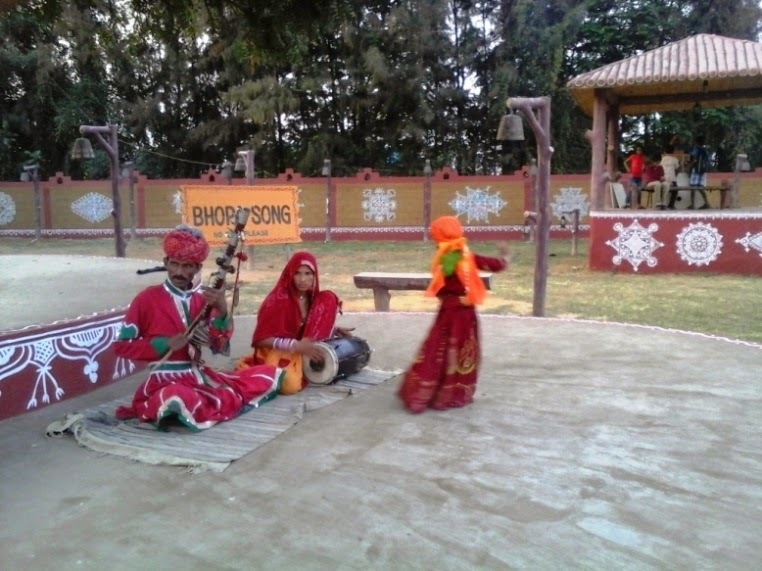 2 life sized dolls of a man and woman styled in Rajasthani attire, and 2 men playing drums & trumpet welcome you. As soon as you enter, there's a paan wala. Soon after him is a beautiful water body, with a stage in the centre. Pedal boat is available at the waterbody, but I guess I'm a bit grown up for a little round on a pedal boat! Right at the centre stage are some musicians and there was also a fake wearable horse (the one worn for horse dance). Yup, I did try it on and did a few steps for their music! Behind this was the actual set up with Jaljeera as welcome drink! 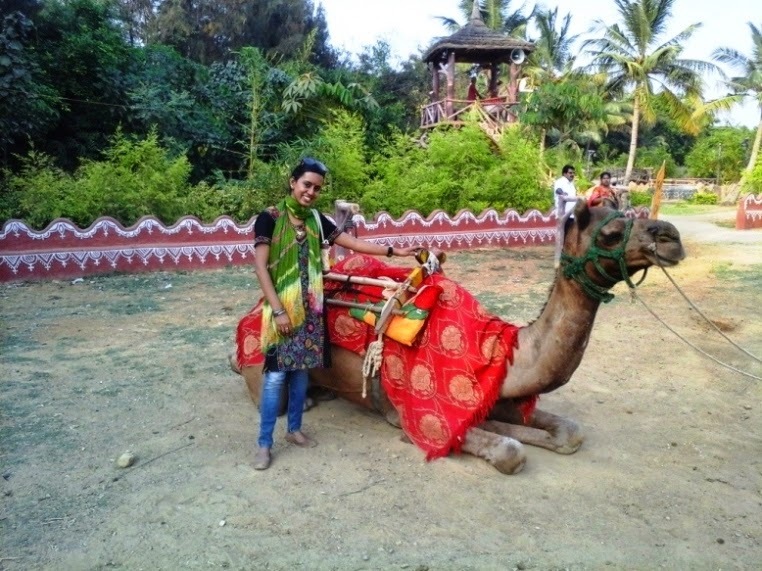 There was bullock cart ride, camel ride, mehendi etc. 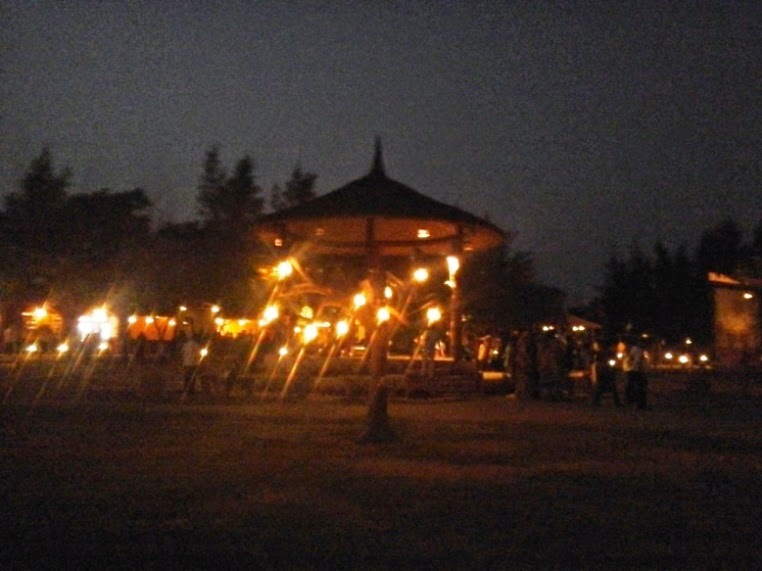 Next to it is a small village set up, complete with little huts, cots as seating arrangements, musicians etc. I got to try 'hukkah' too! Also a small fake well with life size bulls showing the traditional way of water pumping! Next to it was what was called 'Jungle Mangal', a little forest setup, with waterfalls and tree top house with drums too!!! Also there was a artificial cave temple of Sai Baba as well. As time went by, performers started performing. A magician, pulled out a Rs.5 coin which I put in his bowl from my husband's jeans!!! Dancers performed beautiful dance in their swirling skirts and one of them managed to pull me up too, to join them! 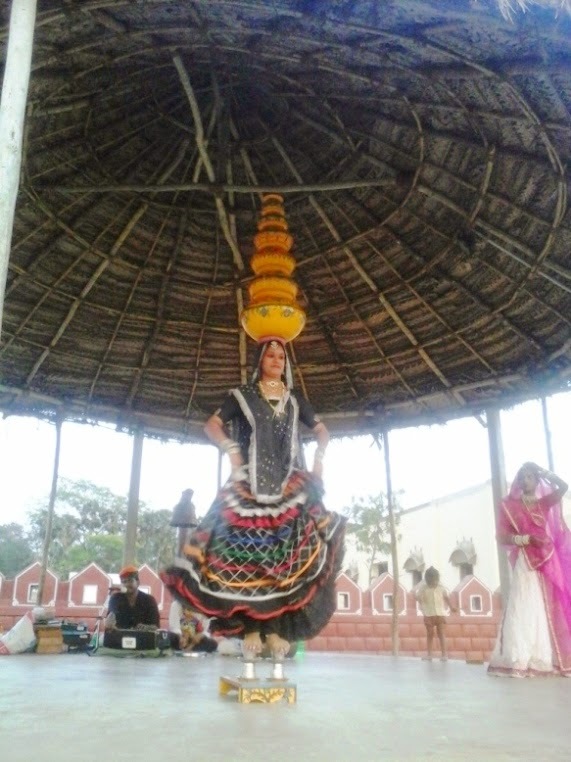 There was this amazing dancer, who took 6 earthen pots atop her head and stood over 2 glass tumblers!!! Katputli or Puppet Show was awesome as well! There were some typical games like shooting the balloon, ringing a toy etc... As night fell, the lighting as great. 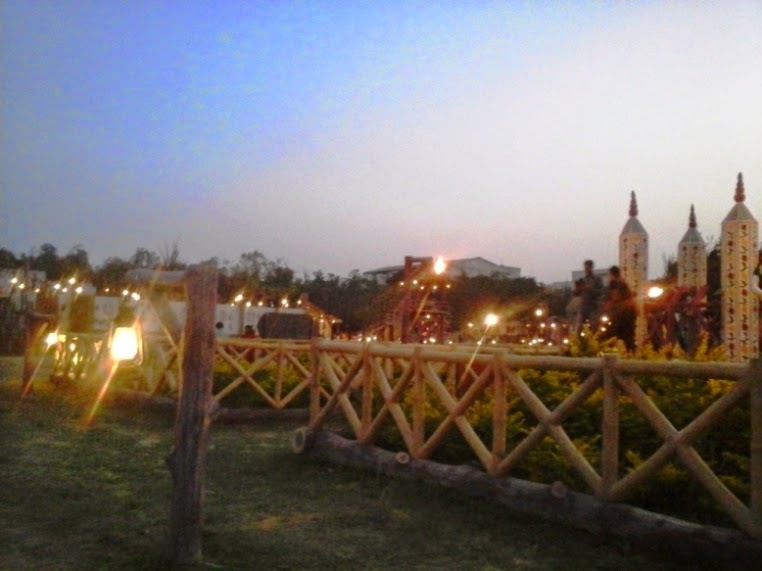 Totally I loved the ambience, it was too good. And finally the dinner - food part! The restaurant was in the interiors under concrete roof. 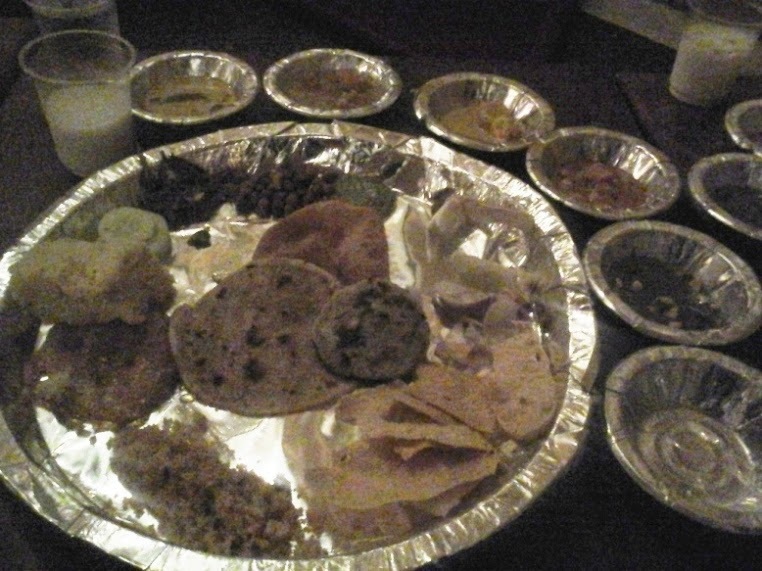 Food was a typical spread of all Rajasthani varieties incl, 3-4 types of roti etc. After that, came the sad part - lemon rice, tamarind rice and some other rice!!! Just because the place is in Chennai, doesn't mean they had to serve rice!!! People visit a place like this, for its uniqueness. I've been to Rajawadu in Ahmedabad, a similar styled restaurant, and I definitely liked their food better than this. 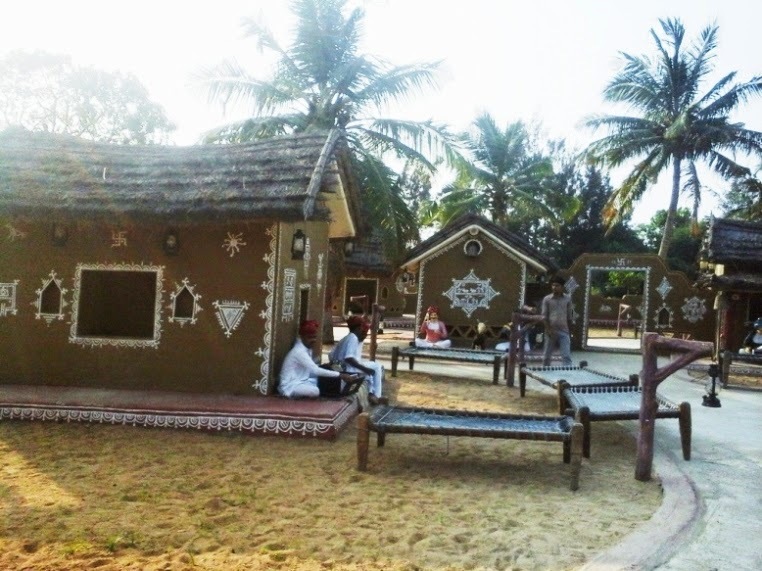 Also Rajawadu served in open huts which just had ceiling, on mud floor, not in a concrete building like this, which also I loved better in Rajawadu. Except for the wrap up - dinner & dining hall, rest, the ambiance, the maintenance, the sheer size I was definitely amazed... That's a great effort!!! Even I heard that their food isnt great, but then I went to Vishala in Ahmedabad and didnt like their food either even though they claim its authentic. 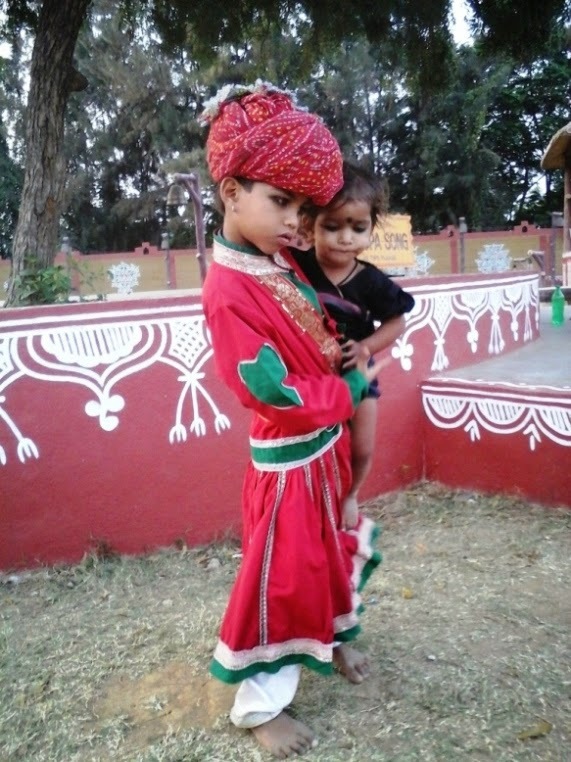 I had been to Chowki Dhani at Jaipur, Rajasthan. After being there, I won't try Chennai one - especially after you told that they serve rice! :) At Jaipur, they serve typical Dal Bhati Churma, Roti dipped in ghee, etc. which I enjoyed. I too had been to Vishala at Ahmedabad recently. I liked it. That's a shame abot the food. The experience looked fantastic. Nice place good fun,food and entertainment ! This is good place to hang out, not so much for food!